As Scorpion, guerrilla commando extraordinaire, you have to blast your way past jungle snipers, naval attack submarines, death-dealing androids and vicious genetic warriors. And that's the easy part. At the end of each level, Scorpion finds a terrifying boss character ready to tear him into "Contra" confetti. --From the Gameboy Contra Operation C instruction manual. 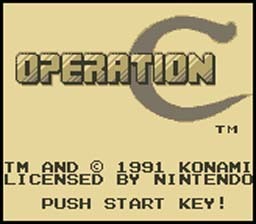 Play Contra Operation C Now! OK and the sound is not that great but still a nice little game. The controls are a bit flakey but not too bad. I would say for a GB game they did a fine job. So what are you waiting for, press the Play It Now button and try Operation C.
Run, jump, and kill anything that gets in your way. Shoot pods flying by to get better weapons.